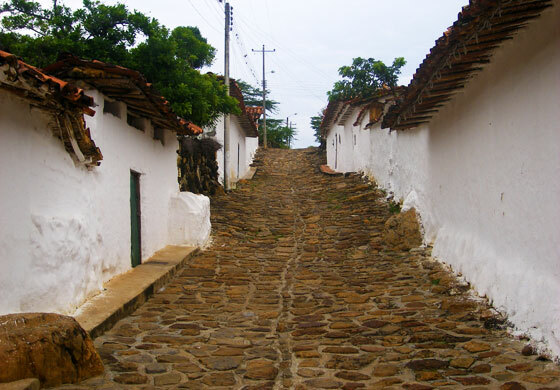 Guane is so perfectly quaint it seems unreal. 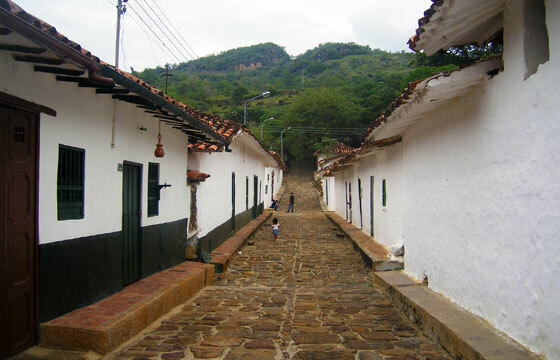 The phrase 'you feel like you've gone back in time' is used to describe many of Colombia's towns, but here it really does seem as if you've somehow slipped back into colonial times. If you arrive here by walking the Camino Real path, the first glimse you will have of the town is of its red-slated roofs poking out of the trees as you pass down the slope leading to the village. Then, turning a corner, one of the town's stony streets comes into view between the trees hanging over the path. From there simply wander the narrow, cobbled streets and marvel at the undeniable prettiness around you. Within a very short time you will have arrived at the central plaza. 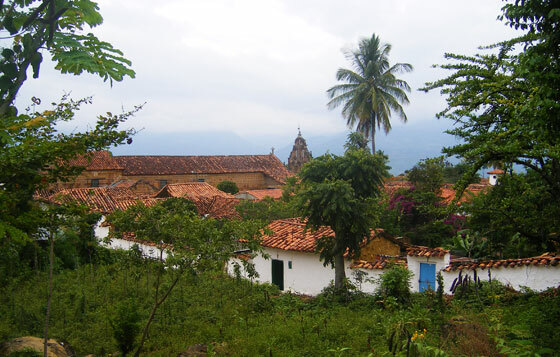 The village is tiny and only spreads out by a maximum of a few small blocks in any direction from the plaza. 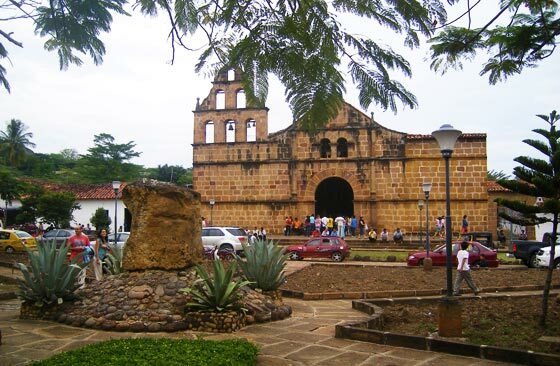 The plaza itself is typical of other towns in the region, and for the that matter the continent, with the small Santa Lucia church as its main landmark. On an adjacent side of the plaza, on carrera 7, is the Museum of Paleontology and Archaeology housing indigenous artifacts and a collection of fossils which abound in the region. Immediately to the right of the museum (as you face it) is a great restaurant where you can try, among other things, cabro (goat meat) and chicha (a liquor made from maize), both of which are typical of Santander. If you don't intend to dine out, but still fancy knocking back a chica or two, the shop on the corner (to the right as you face the restaurant) sells chica at about $1000 pesos a time. Around the plaza are a couple of other restaurants, most of which also serve goat and chica. Chinantoca restaurant, also on carrera 7 (on the street to the left as you face at the church), is a decent bet. Immediately to the right of the restaurant is El Guanerito, a shop selling local homemade sweets; a perfect place to buy presents for relatives with sweet teeth. Try 'sabajón', a sweet, creamy liquor made of goat milk and aquardiente (an aniseed based liquor). They give free samples! Various places around the plaza sell local handicrafts. 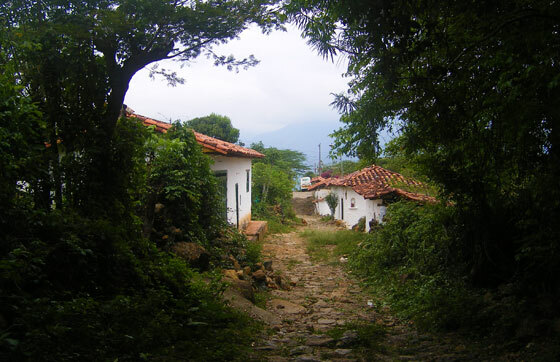 In the north-western corner of the village in a small church with a cemetary which a magnificent view out over the Cañon del Suarez. Realistically there's little in terms of attractions to keep you here for more than a day. If, however, you become particularly enchanted with the place and want to stay a night or two try the Hotel Santa Lucia de Mucuruva, set in a colonial house a couple of blocks from the central plaza. 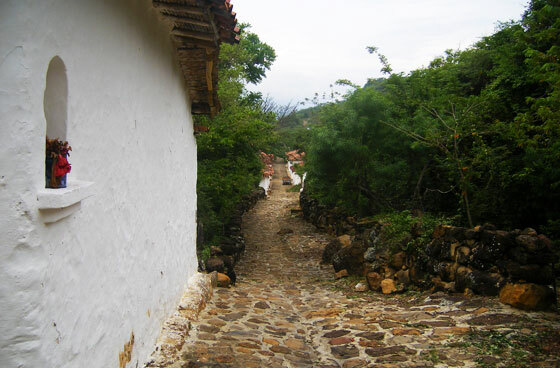 As mentioned in the main Barichara guide you have two options of getting to Guane; either walking the Camino Real, or taking the bus. To get back to Barichara buses leave periodically (frequency varies) from Guane's central plaza. The trip takes about 10 minutes.